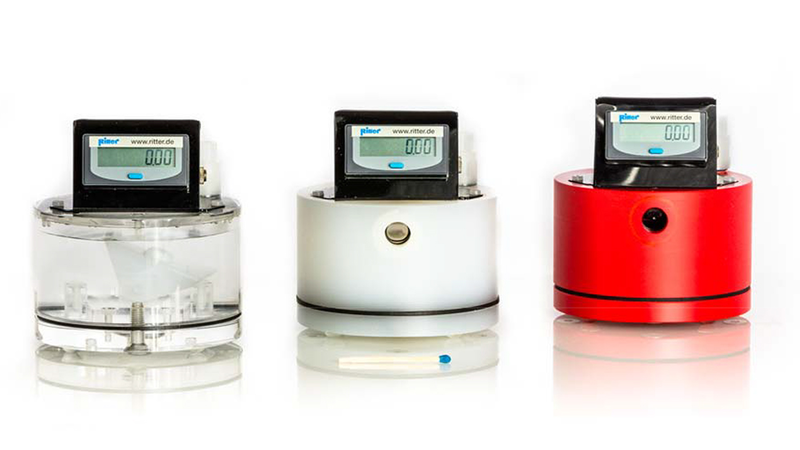 RITTER MilliGascounters (1) (MGC) are designed for the volumetric measurement of the smallest amounts of gas with ultra-low flow rates. They are suitable for measurement of all inert, slightly corrosive gases such as biogas (PMMA model) and aggressive gases (PVDF model). Furthermore, MilliGascounters can be used for volumetric leak detection. The gas to be measured flows in via the gas inlet nozzle, through the micro capillary tube (located at the base) and up into the liquid casing which is filled with a packing liquid. The gas rises as small gas bubbles through the packing liquid, up and into the measurement cell. The measurement cell consists of two measuring chambers, which are filled alternatingly by the rising gas bubbles. When a measuring chamber is filled, the buoyancy of the filled chamber causes the measurement cell to abruptly tip over into such a position that the second measuring chamber begins to fill and the first empties. The measurement of gas volume therefore occurs in discrete steps by counting the tilts of the measurement cell with a resolution of approximately 3 ml (= content of one measuring chamber, please refer to Point 3.2 of the MGC Manual). Please note: the residual error (= max. 3 ml) caused by the resolution should be taken into account when estimating/calculating the total measurement error. The tilting procedure of the measurement cell creates by the permanent magnet (on top of the cell) and one of the two magnetic sensors (reed contacts) a pulse which is registered by the counter unit. The switching pulses of a second reed contact can be obtained via the signal output socket. The measured gas exhausts through the gas outlet nozzle.